Warm up this winter season with a creamy cup of hot chocolate that's heated to perfection right in your crock pot. Great for holidays or chilly movie nights! As the temperatures drop and we’re forced to stay indoors, there are few things more simple and comforting than a cup of hot cocoa. And, hey, what’s not to love? Delicious chocolate heated to perfection and garnished with fluffy marshmallows? I don’t know about you, but that’s certainly how I’d like to get past a cold winter chill. There are multiple ways to make hot chocolate, from instant powder to old school stovetop. But as for me, I tend to prefer using a crock pot? And why is that, you might ask? Well, because when I’m making hot cocoa, I’m making hot cocoa. This is going to be an all-day affair. I’m not going to spend my time multiple trips to the microwave or stovetop. And really, when it’s cold outside, no one wants to get off the couch (or out of bed) unless they have to. I’m getting only getting up once to set the crock pot up within arm’s reach, and once it’s ready, I’m just going to serve myself from my current comfy space. Because that’s what a crock pot-worthy-sized batch of hot chocolate gets me: a seemingly endless supply of chocolatey goodness without interrupting my Netflix marathon. How long can you leave out hot chocolate? Since this recipe makes so much hot chocolate (8 cups or so) you will want to keep track of how long it sits out after the cooking is done. For most foods, the general rule of thumb is that a perishable food should not be in the danger zone for more than two hours. And by “danger zone”, this is usually at or just above room temperature. This same rule can be applied to your crock pot of chocolate comfort. If you’re keeping the crock pot on warm, you might be able to push the time to four hours, but keep an eye on it. Ruining the chocolate with too much heat for too long would be as much of a shame as it spoiling at room temperature. When you’re ready to store your hot chocolate, do so in a sealed container in the refrigerator. The drink should say good for up to four days, ready to be reheated as needed. 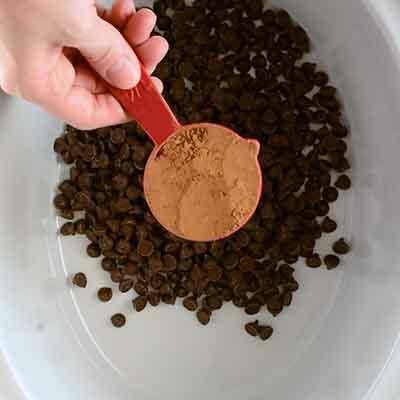 Can you use out of date cocoa powder? If you’re anything like me, you might only crave hot chocolate when you’re stuck in the house during colder weather. And in those cases, you might find you have all the ingredients… but that they’re expired. So, can you still use them? In most cases, the expiration date on baking ingredients is a “best by” date. After that time, the ingredients will lose their potency and flavor, but not necessarily be “bad” or unusable. However, you always want to do a quick smell test. And if you feel confident about the smell test, you could even try taste testing it to be 100% sure (assuming you already know what the ingredient should taste like already). BUT, use your best judgment here, folks. Only do a taste test it if you’re betting on the fact that the ingredient is good and you need confirmation. Don’t needlessly consume something if all signs are pointing to it being a lost cause. Can you add alcohol to this hot chocolate? Oh, I’m so glad you asked this, because I once wondered it myself. And the answer is that you totally can. Just wait to pour in the alcohol (whether it be Rumchata, Peppermint Schnapps, Godiva Chocolate Liqueur, Kahlua, Baileys, etc etc…) until you’re serving out the hot cocoa. Add as much as you’d like and, above all, enjoy! Like the marshmallows used in this recipe? I got them at Sur la Table, but they tend to be a seasonal item. Check your local store to see if they have any in stock. If you like the glasses, I got them at Crate and Barrel. Like the marshmallows, this may also be a seasonal item, so check your local store for availability. How do you make hot chocolate in a crock pot? As with most crock pot recipes, the beauty in this recipe is that all you have to do is add all of the ingredients, cover, and cook. The only exception I have is a recommendation: heat up the milk first in the microwave before adding it to the crock pot. This will give you a jump start on melting the chocolate chips, and as long as you stir the hot cocoa at regular intervals, the chocolate chips will melt faster and not have as many issues with sticking or clumping. 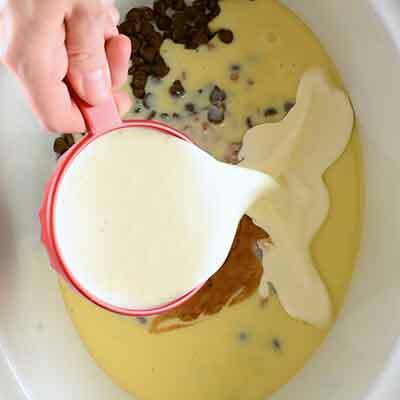 Step 1 – Set up your crock pot and toss in the chocolate chips, cocoa powder, vanilla, heavy whipped cream, and heated milk. 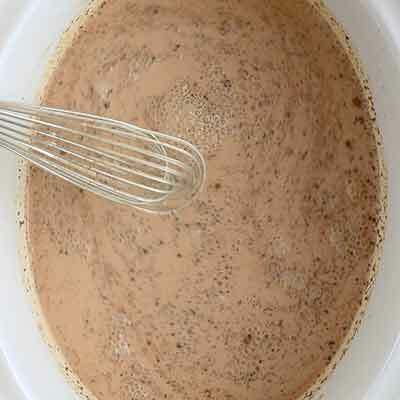 Step 2 – Whisk everything together, focusing on getting the cocoa powder to blend into the milk. Step 3 – Cover and cook! Step 4 – Give the hot chocolate a final stir, whisking away any chocolate that might have filmed over the top or sides. Step 5 – Serve with marshmallows and enjoy! For best results, heat milk in the microwave (1 minute at a time, stir, then repeat) until warm or close to hot. Add cocoa powder, chocolate chips, heavy whipping cream, vanilla, and heated milk to a 6 quart crock pot. Cover crock pot and cook on LOW for 2 hours, stirring occasionally. When ready, turn off heat and serve, garnished with mini marshmallows. Keep hot cocoa in crock pot and cover with lid between serving. If cocoa gets too cool, set to warm for 20 minutes. Hot cocoa should only remain out a maximum of 2 hours before being packed up and stored in the refrigerator. Once refrigerated, hot cocoa can be stored for up to 4 days. Confession time…during the winter time I survive on hot chocolate! So finding a yummy recipe like this that makes a LOT of hot chocolate, and requires very little effort, is a total win. Thank you!! my kids have been asking for hot chocolate since the weather is finally cooled off here! have this in the crock pot now, thanks! I love how easy this is to make hot chocolate for a crowd! There is no place in the recipe for the Condense Milk, when do you add that.? What size crock pot does this recipe call for? Hey Liza! This recipe makes “about” 3 quarts, so 4 quarts or larger should work just fine.